Determined not to be bullied by the extreme weather conditions of the GTA, I braved the treacherous roadways to make it to a special screening of the festive 1980 film Christmas Evil on Tuesday. This 35mm print of the film is one of the only – if not THE only – left in existence. It was a little red in places, but for the most part it had the usual amount of grain and love lines that you would expect from a much-enjoyed print. A lonely toy factory worker named Harry Stadling (Brandon Maggart) loves Christmas. Maybe a little too much. He has a plan to reward those who have been nice and punish those who have not. You better pray you are not on his naughty list! I remembered Christmas Evil from my tenure at the video store, but realized quickly while watching it, that beyond the first scene – which I must have caught in one of those old clip movies like Terror In The Aisles – this was my first time seeing it. The movie itself was a little rough in places, but generally an entertaining ride with one hell of an enjoyably outrageous finale. 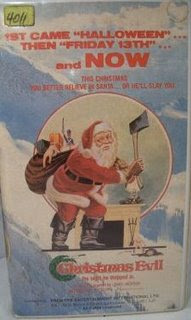 I think one of the most interesting things about Christmas Evil is the air of plausibility that went with it. Now obviously, some of the specific subject matter in the movie borders on the absurd, but considering how obsessed some people get around this time of year, is it completely out of the question that one might just snap and start believing they ARE Old Saint Nick? Another observation to be made here is – and this could just be due to both films being made in the same time and place – how much Christmas Evil shares in common with Bill Lustig’s Maniac. Though I think Maniac has a lot more to offer, there are several parallels between both movies. Nevertheless, that is some good company to be keeping. Christmas Evil director Lewis Jackson was in attendance and stayed for a Q&A afterwards. One of my favourite things about engaging filmmakers about their old projects, is how appreciative and humbled they are that people actually still truly care about stuff they did when they were young and green. Jackson, speaking with an animated enthusiasm, that reminded me of Marty Scorsese, talked at length about how for years he was absolutely hated for his part in making Christmas Evil. It was only after finding new life on home video and being championed by a few select filmmakers like John Waters (who maintains Evil is one of his favourite films of all time) that it has endured. It took a long time for general audiences to catch up to it and see the embedded dark humour that a lot of horror works of this era utilized. It was a good night and I was glad that my inadvisable choice to be out on the roads that evening was worth it. While watching Christmas Evil, I too found similarities to Maniac, both in tone and the characterization of the main characters.